Dear reader we will discuss here about organic content in fine aggregate. We will not include consequence of organic content in concrete, just discuss about ASTM specification for organic contamination in fine aggregate. We have already learnt about influence of organic content in soil, like this concrete is also subjected to their detrimental effects. The fine aggregates having darker color are suspected to have organic impurities and often many specifier or purchaser rejects them at first sight. 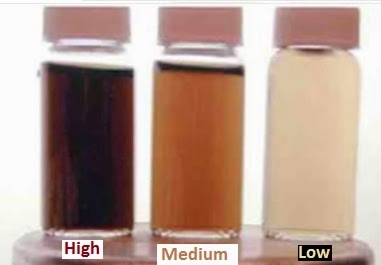 A simple colorimetric test is conducted to determine the quantity of organic content in fine aggregate. We will learn tests that are conducted, as per ASTM standard, for this purpose. But darker color is not due to only organic content; there may have other discrete particles like lignite and coal etc. in small quantities. Very often these discrete particles render discoloration in sand and code suggested not to reject sand only depending of color. Such sand, failed to pass this test, can be used if it passes Test Method C87 with certain condition. When mortar produced with this sand having organic impurities is tested for impact of organic content on strength, produce a relative strength after 7 days varying not less than 95 percent. As discussed above test is done according to C87 (ASTM).